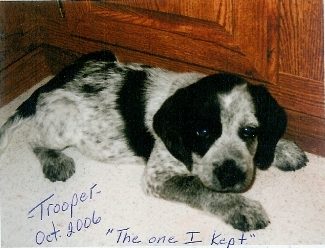 Kai was a young Collie adopted from the Meade County Animal Shelter in late 2002. He was found as a stray and picked up by animal control. Nobody claimed him but as fate would have it, Robin White contacted a PINS member reporting that sadly she had to have her very old Collie "Jake" put to sleep because of his failing health. Robin mentioned that she wanted another Collie since she was familiar with the breed and had been involved in Collie Rescue in New Hampshire some years ago. The PINS member told Robin that there was at that very moment a nice young male Collie available at the shelter. Robin immediately went to the shelter, fell in love with him, and made arrangements for her other dog (Misty) to meet "Kai" before a final decision was made. Seems Misty said it was "OK," and they got along fine. The rest, as they say, is history. Kai and Misty now share a wonderful home with Robin and all are quite happy. 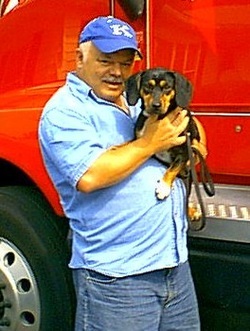 Jumbo was adopted from our Shelter by truck driver James (JD) Dials. Jumbo now travels all over the United States with JD. She loves the trips and is always ready to go when they head for the truck. She loves to play fetch and other games at rest stops. There are always lots of treats and toys on hand for her. Her home address is in Battletown. P.S. Jumbo is a Beagle/Dachsund mix ... or a "jumbo" hot dog! 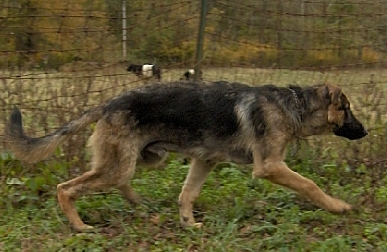 This year-old German Shepherd arrived at the Shelter with a large frame but no meat or muscle and very little hair; so debilitated that his hind legs tangled when he walked. A Shelter visitor drawn to the needy big-footed pup adopted and took him straight to the vet clinic, where Dr. Mayer dealt efficiently with mites, mange, damaged ears, necrotic skin and other miseries. At his new farm home in Paradise Bottom Gus was medicated and shampooed repeatedly and fed frequent small meals, slowly working up to triple rations. He was transformed in a few months from a wobbly 58-lb. skeleton to 110 muscled lbs. with a luxuriant coat regrowth. Everything came back except his ears, which continue to flop in a quizzical-hound style. Gustav today is in perfect health. 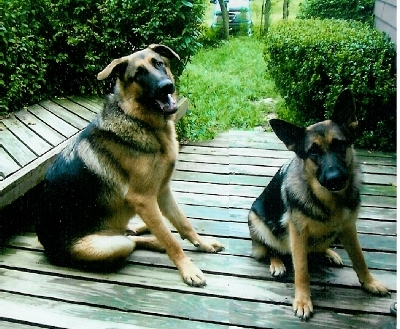 He's intelligent, calm and mellow, anxious to please and altogether a delightful companion dog. Another rescue recently joined him, a female the same age but just half his size. Gus appears to regard Mandy as his personal wind-up toy. The Mutt & Jeff pair roughhouse and romp until they drop like stones to zonk out. A generous foster home saved and found adoptive homes for not one, but eight Cocker Spaniels! 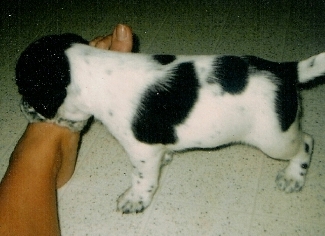 Here's the tale: "While searching for my lost Bassett mix at the Shelter I met a Cocker Spanel. She was very skinny except for her big belly -- she was due to have puppies at any time. I offered to 'foster' her so that she could give birth in a warm and loving home. "She bonded to me very quickly (I think I was the first person in her life to actually love her). She had tapeworms and we got pills from the vet. She slowly picked up weight. After two weeks I woke to find two pups. I was so excited! It was obvious that there were more to come so I called work to let them know I'd be late. After a long and tiring labor mama had 7 live babies, 2 girls and 5 boys (an 8th was stillborn). 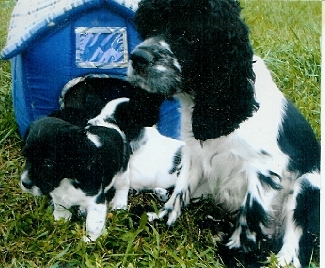 "The pups were nursing well and Princess was a great mother. She was given special food because she was so undernourished, and when the pups went for a vet check we learned she had a calcium deficiency as well as buckshot in her ribs just under the skin, healed over. "The Shelter had promised to take back Princess and the pups after six weeks, but I started hunting up homes for 'my' babies. I found a perfect home for Princess with an older lady that loves her very much. "I found GOOD homes for every puppy except one, the one I decided to keep. I now have 3 inside dogs, 2 sugar gliders, 1 chinchilla, 1 outside cat, 1 beta, 1 hamster, and 2 lizards. "I feel I was meant to be at the Shelter that day, to give Princess and her babies the chance they deserved!"